Google’s Android OS powered phones were in most of the tech blogs since the past few days with first the sneak peak, and then the hands-on reviews of the phone which first came with T-Mobile. It is said to be one of the best phones around and competitor for the World’s dominating mobile company Nokia, and to the best gadget of the year Apple iPhone. 1. The open operating system – The Android OS powered by Google is an open system, which can be played with by the developers and many cool apps and games would be coming in, and there would be everything available for free, unlike the paid apps as in the App store by Apple. And being a Google product, developers would get really handy with Android. 2. Faster than iPhone – iPhone was already fast, but the reviews of Android phone already state that the phone is faster than the Apple iPhones. Speed always counts, and Android beats iPhone. 3. No Jailbreaking needed – Its an open operating system, so there will be no hacking in or jailbreaking needed for its OS. It will be easy to customize too. 4. Online applications integration – Google products like Docs, calender and maps with Street view, everything would be just a small work to integrate into the Android mobile. Apple does not have those kind of apps, so no integration needed. 5. QWERTY Sliding keyboard – The phone does not look too bulky but it still has a QWERTY keyboard, sliding out when u need it. This is not in iPhone, there is a touch-screen there, which is not so user-friendly for people not good at touching the screens. 6. Format supporting better than Apple – Apple OS is something which does not become easily compatible with many file formats which Windows and Linux does. So Google is working well with this, trying to make the Android phone support almost all file formats. There are many other points, but these are off the top of my head. Here’s one reason why it won’t succeed: No big name branding. No one was interested in hearing what Apple was thinking in terms of phones until they introduced the iPod and it sold like crazy. If the cell carriers can push the Google name (instead of focusing on “Android”) this could have moderately good success as well. Reason 1) Dude, apps are free in the Google app store, for now. After the New Year, the Google store will have pay apps. And, if developers don’t get paid, why would they waste their time writing an app, other than for novelty value? 2) Speed is related to the network. AT&T’s 3G network has tested faster than any other, in the US. Also, T-Mobile’s 3G network is ONLY in 21 cities, while AT&T’s is in over 200. 3) Yep, all the Linux users will be so happy. I mean, everyone uses Linux, right? 4) Dude, all those Google apps are ALREADY on the iPhone except for Streetview. 5) Yeah, schizophrenia, seeing as the G1 has touch, it has a keyboard, it has a trackball. People are going to get confused when to use what! 6) Which file formats are you talking about? Both Google and Apple are supporting web standards. In fact, Google uses Apple’s rendering engine, WebKit as the basis for Android and Chrome. The reason Apple does not support some formats is because they are not standards, like Flash and DIVX. Thanks for info. It’s too valuable goods. Thanks again…. 1. The speed of the Android G1 CPU is 300 ghz. The speed of the iPhone CPU is 650 ghz. The Android G1 is half the speed of the iPhone. Period. 2. The Android G1 is SIM-locked – tied to T-Mobile. 3. T-Mobile THROTTLES 3G download speeds to 50 kbps (1/3 the speed of AT&T’s slower EDGE network) when you surpass 1 gig in data downloads. 4. The Android G1 does NOT have a 3rd party ECOSYSTEM of accessories to customize it for yourself. 5. The Android G1 does not support bluetooth. 6. The Android G1 does not support standard headsets – you have to get a mini-USB adapter for them. 7. 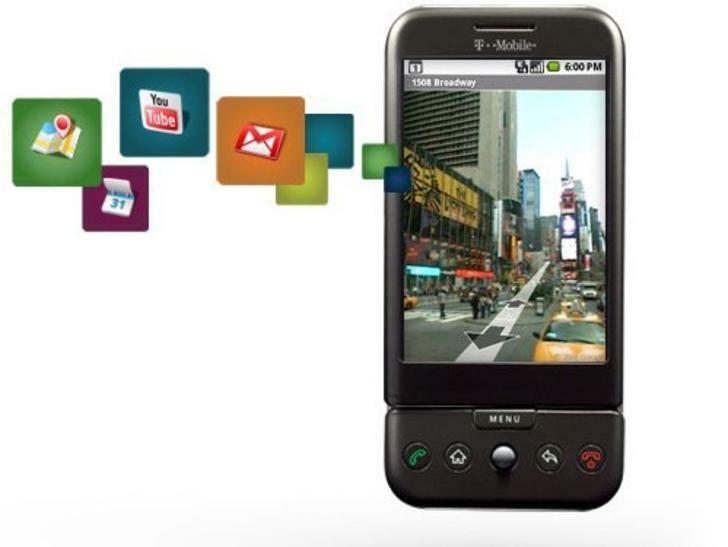 The Android phone does NOT synchronize to your desktop data, music, or movie collection. I am not very technically endowed but having a review that is easy to understand and in layman’s terms is a great help to us technically deprived. I wonder now if it is better to get what you recommend instead of the Iphone. 1. The specs for the G1 show its CPU at 528MHz. The iPhone CPU appears capable of 620MHz, though it seems Apple keeps it underclocked to 412MHz to preserve battery life. 2. Valid point, but the iPhone is sim locked to AT&T. 3. T-Mobile changed its mind on throttling 3G service for now. 4. To say that no third-party accessories market exists for the G1 is a non-issue. The phone hasn’t even been released yet. It’s extremely unlikely that the G1 will be ignored by accessories manufacturers. 5. The initial release of Android does support Bluetooth, though it is limited to mono. Stereo sound, file transfers, etc. will come in later upgrades to the operating system. 6. Your point is valid, but needs a little clarification. Standard headsets are supported, but there is no standard 3.5mm jack to plug them into. The phone instead uses HTC’s proprietary ExtUSB input. Standard headsets can be used easily with an ExtUSB-to-3.5mm adapter. 7. Valid point, but again it should be noted that this is not supported in the initial release of Android. Future releases of the software absolutely can have this feature. anyday i think other phones are better than Iphone, i just hate iPhone to no limits. Its so confusing for me. 1) The Android’s CPU is 528mhz, not 300mhz! 2) Although T-Mobile had originally planned on limiting bandwidth to 50kbps after 1gb of data transfer per month, they have since REMOVED that clause from their terms of service due to backlash from customers. I don’t understand why people are complaining so much about the amount or quality of software apps. Isn’t the point, or at least a big advantage of this phone that it encourages improvement upon, and tweaking of a basic platform? The phone i guess will give tough competition to the iPhone, but have to see what the pricing will, a great deal depends on the pricing and the presence of a Qwerty keyboard also is a plus point for the android in comptetion with the iPhone. The Iphone had its time get over it. The G1 and even the mytouch are going to take it out. Thats why the iphone is now selling for 100 bucks. Plus for whoever said its by a no name company. The G1 is made by HTC and if you know anything about cell phones. HTC is one of the leading cell phone manufacturers ever. Look at all their phones they are made well and work amazing. Apple should of stayed to IPODS they dont go with any different designs or anything. Im sick of them alltogether and people thinking they are so damn cool. THEY BLOW!!!!!!!!!!! you raised some key points above but i am not sure apple lovers will give a damn about this really!